It takes more than leadership skills to run a successful marketing team, according to Defence Force Recruiting’s general manager for marketing, Pat Duffy. Marketers also require a healthy dose of honesty and humility. “I’ve been very lucky in my career, but it’s also important to remember you have to be brave enough to admit what you don’t know and plug the gaps,” she told CMO. Duffy has been in her post at Defence Force Recruiting for the past eight years and has seen the marketing function undergo significant change over this time. When Duffy first joined in 2007, she found the Australian Defence Force's advertising approach was based more around methods of entry. While there was some service branding, the focus was more about joining the ADF and becoming a pilot, or gaining a technical trade. Duffy’s 30-year marketing career spans across multiple industries and companies, but a common thread has been her ability to tackle significant brand development and transformation. She began her career at IBM before moving into sales, product management and marketing. Duffy then moved into marketing leadership and management roles for Amdahl, Optus, Telstra, St George, MLC and STW Communications. Duffy said working as a director for corporate marketing and then director of communications at Telstra is one of her biggest career highlights. With a team of more than 100, Duffy said the telco underwent significant change as it strived to transform its brand positioning. One key step Duffy took was to restructure the entire marketing matrix. There was also a roster of agencies working with Telstra, which Duffy said were competing with each other. Following various marketing roles in the financial services and a business development role at STW Communications, Duffy moved to Canberra and took on the position at Defence Force Recruiting. For Duffy, the challenge at Defence Force Recruiting was shifting from the traditional influence marketing, to a more inspire and educate focus. “Ultimately, I believe a marketer’s job is to influence people, but at the ADF, the focus is on inspiring people to join the Navy or the Airforce, showcasing the skills they can gain and the opportunities ahead, as well as of course serving the nation,” she explained. 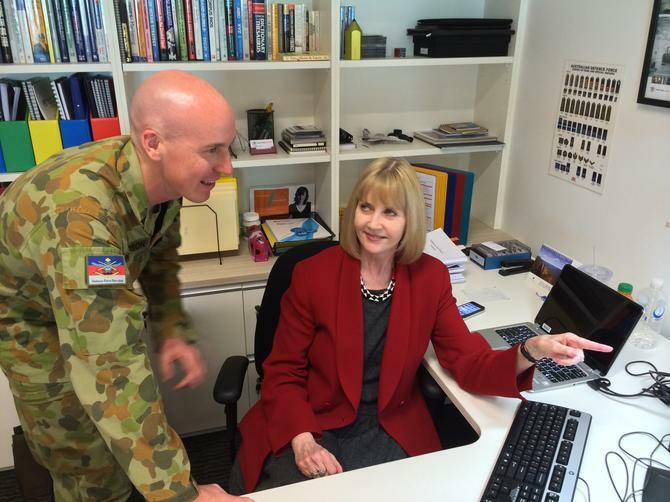 In order to help raise awareness and boost engagement with the next generation of prospective recruits, Duffy has been instrumental in Defence Force Recruiting opening its social media channels for the first time. Duffy now has a small group managing the Defence Force Recruiting social media, along with a Facebook page dedicated to job alerts that has more than 300,000 fans. Through a slow and steady build of Facebook followers and engagement, the page is also a platform through which the Defence Force promotes its key recruiting informational sessions. Defence Force Recruiting also runs live Q&As on Facebook, with ADF professionals who give insights into their careers. Duffy claimed these can have over 1000 registrations. “We have our experts answering questions days after the event is over because of the volume of backlog of interest,” she said. Despite the boost in engagement, maintaining the social platforms are not without inherent risks. Duffy said she always reminds her team to remember the environment in which they’re working in, and the risk of doing anything wrong could quickly amount to shutting down of the whole page. One challenge Duffy continually battles is the need to generate very engaging social content quickly to carry a message. Conversion is a long-term process, Duffy noted, and an individual may show initial interest but take years to decide to join.